Looks like this blogger presented the chart as an implicit argument about the quality of literature being read today, rather than the quantity. We were a civilized civilization. This was before the Internet and cable television, and so people had these, like, wholly different desires and attention spans. They just craved, craved, craved the erudition and cultivation of our literary kings and queens. Well, that time never existed. Check out these stats from Gallup surveys. 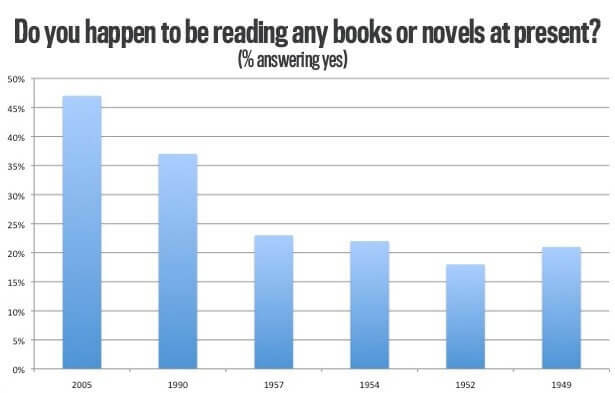 In 1957, not even a quarter of Americans were reading a book or novel. By 2005, that number had shot up to 47 percent. I couldn’t find a more recent number, but I think it’s fair to say that reading probably hasn’t declined to the horrific levels of the 1950s. —The Next Time Someone Says the Internet Killed Reading Books, Show Them This Chart – Atlantic Mobile. 7 Apr 2012 in Books, Culture, Cyberculture, Humanities, Social_Software, Technology. Younger friends, can you write or read cursive? I’m curious. The problem with blog comments, in 5 images. khalifa on Technical Writing: What Is It?